It’s not what you want that matters but what you need. While packing for a mountain biking ride you need to have the right tools and parts so that you overcome any situation that may arise. If you are a beginner, you will have a tendency to pack all the tools and accessories you have but all that’s not necessary. Well, if you are planning for a whole day’s ride you need to carry the necessary food and drinks. 1. Mini bike pump: You will need a good quality mini pump that can fit in both the presta and shrader valves. This can be an alternative for the expensive CO2 inflators and cartridges, which are much useful for racing. 2. Multi tool: Most good quality multi tool kits offer a chain breaker apart from the Allen keys so as to enable the rider to overcome issues with your chain. Never leave without this! 3. Spare tubes: One or two should do. This is helpful even if you are running tubeless tires. 4. Tire levers: A three-piece or two-piece tire levers should do the job well. Tire levers are important to take the tube off the tire, in case of a flat. 5. Spare brake pads: Most mountain bikers use disc brakes so its safe to carry a pair of pads as some pads wear out easily. 6. First aid kit: How much ever experienced rider you are, you must carry this. You must include an antiseptic, Band-Aids, cotton, gauze wraps and maybe some pain killer tablets. It’s necessary that you need to know how to use the first-aid kit properly. 7. 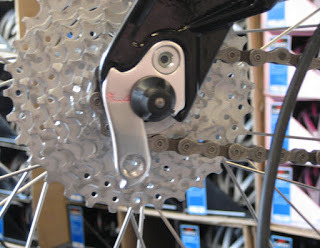 Rear derailleur hanger: It is the small metal part that connects the rear derailleur to your frame. It varies in size and shape for different bikes of different brands. It is a part that has to hold a lot of stress while riding so the chances for it being broken is so high and its frequent among mountain bikers. 8. Hydration bag: Carrying a hydration bag while mountain biking is advantageous compared to carrying water bottles. Hydration bags can hold more volume of water (2-3L) and also can be used throughout the ride. But if you are using water bottles, you need to refill it from time to time. Moreover you can use a hydration bag while riding which is not possible while using water bottles. 9. Mobile phones: This does not need elaboration, and can be a real lifesaver in case of emergencies. Keep people at your home informed. Its necessary that you have an Emergency contact-number that is displayed prominently or has been given to a fellow rider. 10. Money: Carry sufficient amount of money. Carry enough money to reach home in case of injury or mechanical failure by another mode of transport. 11. Torch/Headlight: If you are unable to reach home before dawn, this one take you home safely or help you in case of mechanical failure. Above are some of the must have things that you should have in your backpack when you’re out on a mountain bike ride. Beyond this riders have their own needs. For me, the lesser I carry the faster and better is my ride. Apart from this, you need to wear proper riding gear, most importantly your helmet and pads. Be safe on your bike. Ride responsibly!